Set up your own monstrous laboratory at home! Turn the kitchen (or any other suitable room) into a lab for your young child to explore and experiment with paint and print-making. Combine science and art into one spooky Halloween-inspired project. This activity will encourage your child to discover the scientific process, compare sizes, and build shape recognition skills. These vital science and maths concepts will help her build a foundation for learning throughout the years to come. Using the paintbrush, have your child mix some truly monstrous colour creations. Remember, this is her art laboratory so allow her to experiment with the paint colors (even if she creates a muddy brown). Add more paint if needed. Help your child to paint her hand (palm side) with one of the colors. For the more adventurous, have her dip her entire hand (palm down) into a paint puddle. Ask your child to firmly press her hand onto either the left or right side of the construction paper. This will create a hand print. Leave enough room on the construction paper for the monster hand print. Help your child to paint her hand again. This can be the same or another colour. Repeat the hand printing technique. Ask your child to think of the size and shape of a monster’s hand. It may be helpful to reference a story book picture. Help her to use a pencil to draw the size and shape of the monster’s hand around the second hand print. Have your child use the paint brush, or painted hand, to fill in the pencil outline. Use paint to add some monstrous fingernails and any other details you might like. 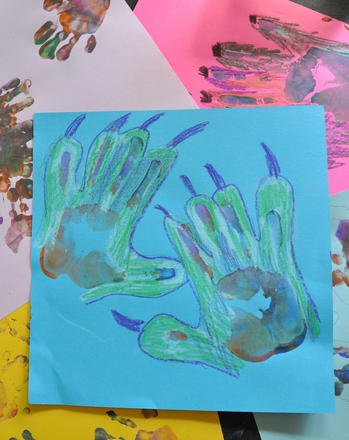 Once the paint has dried, ask your child to compare and contrast her plain hand print with that of the monster print. How do they look different? Which one is bigger or smaller? Are there different shapes for the fingers? Get in touch with your inner monster! Use this fun monster alphabet series to practise those ABCs with your little reader in the spirit of Halloween. Dare to do some drawing with this monster "D"! Your child can get a great review of her ABCs as she colors. Uh oh, alphabet practise just got a little more mischievous! Enjoy this monster alphabet series with your little learner. Review the ABCs with your little monster as he colors this ferocious looking letter T.
Satisfy your little monster's appetite for ABCs with this fun monster alphabet page. Have a fun alphabet review with your little monster while you colour this capital letter E.